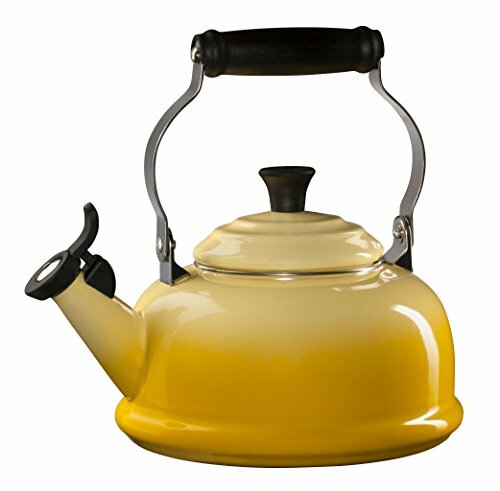 Indulge in a relaxing hot cup of tea with this whistling tea kettle from Le Creuset. This amazing kettle is made of heavy gauge carbon steel with the same double coated enamel of Le Creuset cookware that won't absorb odors or flavors. The specially designed enamel on steel provides uniform heating, while the steel rims prevent chipping. The low and broad base allows for quicker boiling time with its maximum surface contact, and the upright locking high handle provides safe and easy transport. The knobs and handles are made from a phenolic resin that is heat resistant up to 450 degrees Fahrenheit, making it easy to pour without fear of burns. Backed by a manufacturer's five year warranty, this kettle also features a levered whistle and a flipping spout for easy pouring.